Fletcher Cox is the latest Mississippian to win a Super Bowl ring. He was a standout athlete at Yazoo City High School who played football, basketball, and ran track. Cox was recruited to play football for Mississippi State University in 2009 and was drafted 12th overall by the Philadelphia Eagles in the 2012 NFL Draft. In his first Super Bowl appearance, Cox anchored the defensive line as the Eagles earned their first Super Bowl Championship in franchise history at Super Bowl LII. Cox is the first Yazooan to win a Super Bowl since Willie Brown won with the Oakland Raiders in 1976 at Super Bowl XI. Since becoming an Eagle in 2012, Cox has made headlines numerous times for his outstanding skills on the field and also for showing his love of his hometown, Yazoo City. Despite his years in college and professional football, Cox still credits his small-town upbringing by his mom Melissa, his Yazoo City High School counselor Christie Cader, his late high school position coach Kyle Wallace, and his late brother Shaddrick for encouraging him and instilling in him an unparalleled drive to succeed. Leading up to his Super Bowl win, the world-class athlete told reporters that the most satisfying sack of his entire career took place when he was a Junior at Yazoo City High School when his strip-sack and resulting touchdown run helped lead Yazoo City to a 20-14 win against Pearl. During the player introductions before NFL games on television, while many players tout their college Alma mater, Fletcher Cox introduces himself as being from Yazoo City High School. Fletcher Cox, whose nickname has been “Bug Eye” for as long as anyone can remember but has recently become known as “Champ,” who has sponsored summer football camps in Yazoo City helping to bolster the dreams of many area children, who has donated a truckload of bicycles for a local giveaway, and who always brags about his love for his hometown, will be honored by the City of Yazoo City and her citizens on Saturday, March 24, 2018, with a parade and celebration to follow. 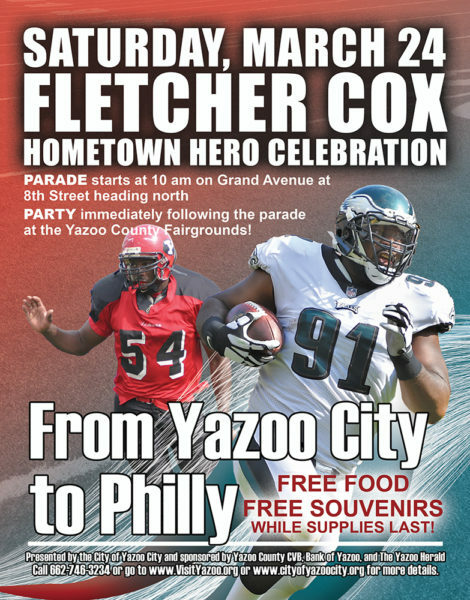 The Fletcher Cox Hometown Hero Parade and Celebration will begin at 10 a.m., on Grand Avenue near 8th Street, will travel north through Yazoo City, and will culminate with an open celebration on the Yazoo County Fairgrounds, 203 Hugh McGraw Drive, Yazoo City, Mississippi. The festivities on the fairgrounds will include free cotton candy, popcorn, drinks, hot dogs, hamburgers, free souvenir giveaways while they last, and much more. Admission is also free and the parade and celebration are open to the public. For more information about the Fletcher Cox Hometown Hero Parade and Celebration in Yazoo City, Mississippi, contact Olivia McCoy, Executive Assistant to Mayor Diane Delaware of the City of Yazoo City, at 662-746-3234 or download a parade registration form below or at www.cityofyazoocity.org. Learn more about dining, lodging, activities, and events in Yazoo City and County here at VisitYazoo.org. 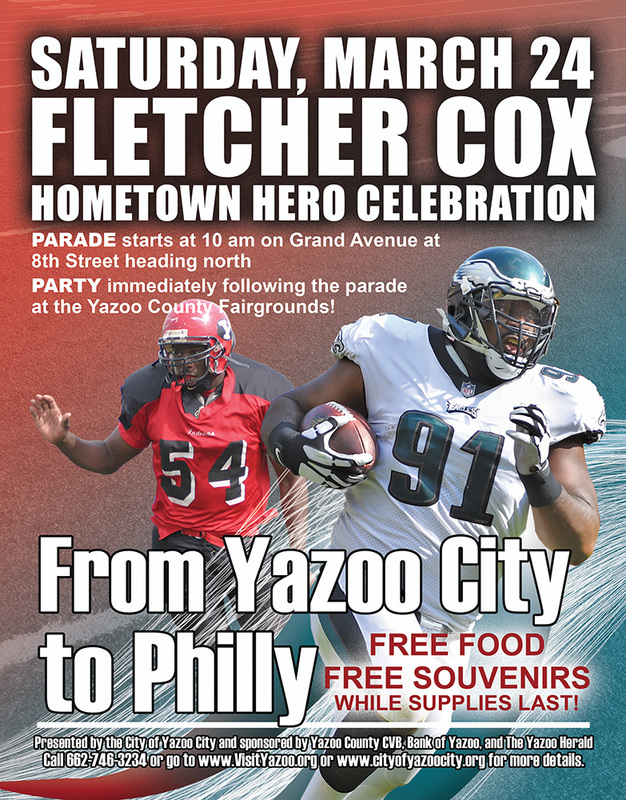 The Fletcher Cox Hometown Hero Parade and Celebration is presented by the City of Yazoo City and sponsored in part by the Yazoo County Convention & Visitors Bureau, The Yazoo Herald, and the Bank of Yazoo. Click here to download an entry form to participate in the Fletcher Cox Hometown Hero Parade in Yazoo City. Forms must be submitted by Tuesday, March 20, 2018! Good evening, my name is Cedric Conley and I live in Ridgeland, Mississippi. I am a Philadelphia Eagles fan and I would like to come to the parade, but I am not familiar with the city of Yazoo City. May I have some directions coming from Ridgeland going towards Yazoo City and where the parade will be taking place? Will there be any autographs signings as well? Good afternoon, Cedric! Thanks so much for your post. We would love for you to join us in Yazoo for this celebration. The most direct route to Yazoo City from Ridgeland would be to take 49 North into town. When you get to Yazoo City, you can take a right at the 2nd red light (15th Street). With the parade planning to come through the Grand Avenue intersection at 15th, my recommendation would be to take the first left after you cross the railroad tracks (Jackson Ave), and drive down to 12th Street. Take a right on 12th from Jackson Ave. At the Grand Avenue and 12th Street intersection, the old Kaye’s Grocery building is currently vacant after their recent move to Hwy 49, and I bet that their parking lot would make a great viewing location for the parade. I am sure others will have the same thought, so I hope you get there in time to get a spot.